^ 1.0 1.1 1.2 S. A. Hsu; Adele Babin. Estimating the Radius of Maximum Winds Via Satellite During Hurricane Lili (2002) Over the Gulf of Mexico (PDF). [2014-02-23]. （原始内容 (PDF)存档于2012-02-06）. ^ Donald W. Burgess; Michael A. Magsig. Understanding WSR-88D Signatures for the 3 May 1999 Oklahoma City Tornado (PDF). [2014-02-23]. （原始内容存档 (PDF)于2013-03-21）. ^ Brian W. Blanchard; S. A. Hsu. ON THE RADIAL VARIATION OF THE TANGENTIAL WIND SPEED OUTSIDE THE RADIUS OF MAXIMUM WIND DURING HURRICANE WILMA (2005) (PDF). Coastal Studies Institute. Baton Rouge, Louisiana: Louisiana State University. [2014-02-23]. （原始内容 (PDF)存档于2012-09-05）. ^ United States Department of Energy. Natural Phenomena Hazards Design and Evaluation Criteria for Department of Energy: E.2.2 Additional Adverse Affects of Tornadoes: E7. [2014-02-23]. ^ 7.0 7.1 Hugh Willoughby. Sixth International Workshop on Tropical Cyclones Topic 1 : Tropical Cyclone Structure and Structure Change (PDF). Severe Weather Information Centre. 2006-10-06 [2014-02-23]. （原始内容存档 (PDF)于2012-02-19）. ^ Teruo Muramatsu. The Study on the Changes of the Three-dimensional Structure and the Movement Speed of the Typhoon through its Life Time (PDF). Tech. Rep. Meteorol. Res. Inst. Number 14. 1985: 3 [2014-02-23]. （原始内容存档 (PDF)于2013-02-08）. ^ National Weather Service. Glossary: D. National Oceanic and Atmospheric Administration. 2009-06-25 [2009-11-20]. （原始内容存档于2013-10-19）. For locations on the left-hand side of a tropical cyclone's track (looking in the direction of motion), a direct hit occurs when the cyclone passes to within a distance equal to the cyclone's radius of maximum wind. For locations on the right-hand side of the track, a direct hit occurs when the cyclone passes to within a distance equal to twice the radius of maximum wind. ^ Kerry A. Emanuel. Maximum Intensity Estimation. Massachusetts Institute of Technology. [2014-02-23]. （原始内容存档于2012-11-01）. ^ Edward J. Walsh; C. Wayne Wright. Hurricane Wave Topography and Directional Wave Spectra in Near Real-Time (PDF). [2009-03-27]. （原始内容 (PDF)存档于2009-03-27）. ^ Agnieszka A. S. Mrowiec; S. T. Garner; O. Pauluis. 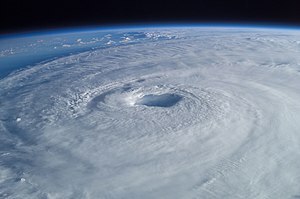 What Sets a Hurricane's Radius of Maximum Wind?. 27th Conference on Hurricanes and Tropical Meteorology (American Meteorological Society). 2006-04-25 [2014-02-23]. （原始内容存档于2012-02-20）.